Homemade raspberry vanilla bundt cake with a store bought frosting decorated for Breast Cancer Awareness. Those adorable pink ribbon sprinkles make this cake. October is breast cancer awareness month. Like most families, I’ve lost a loved one to breast cancer. 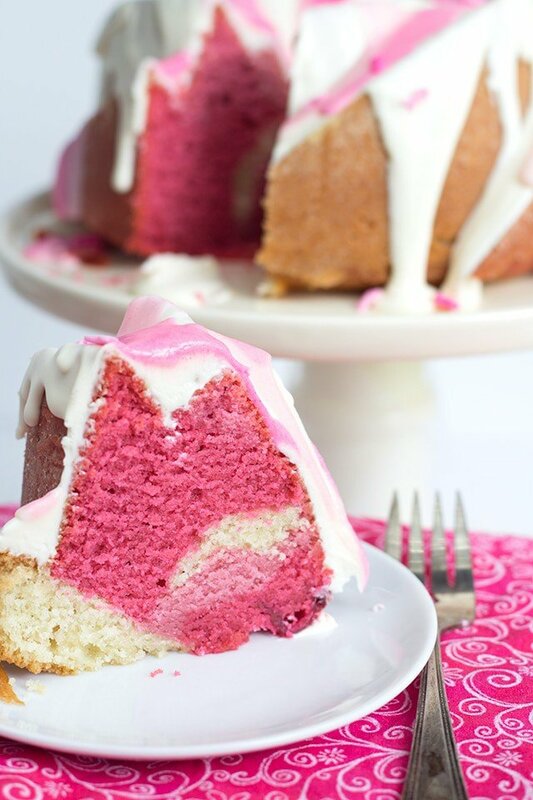 This raspberry vanilla pink ombre bundt cake is for you my dearest Aunt Marion. It’s been too long since I’ve seen your face. You would love this ombre cake, I’m pretty sure. I didn’t have strawberries, but I did have some frozen raspberries that I cooked down into a paste. I flavored the pink parts with the raspberry paste and left the white part just vanilla bean flavored. Then for the left over raspberry paste, I poured it on top of the batter before I placed it into the oven. It soaked into the cake and added a zing of flavor into spots of the cake. With a fine mesh strainer placed over a saucepan, press the juice and pulp of the raspberries. You will need 1 cup of raspberry juice and pulp. Place over medium heat and let it cook for 30 minutes, stirring often. You will want it to turn into a paste. When it gets thick, it will burn easy to stay close and stir constantly. You'll want it to reduce down to 1/3 of a cup. Preheat oven to 325 degrees. Grease a bundt pan and dust it with flour. I used the Nordic Ware Heritage bundt pan. Slice the vanilla bean down the center and scrape all the seeds out and into the butter. If you don't have a vanilla bean, feel free to use 2 teaspoons of vanilla bean paste. Add in each egg separately and mix until incorporated. Separate the batter into four bowls. Leave one plain vanilla. Add 1 tablespoon of raspberry paste to the other 3 bowls of batter. Add a drop of rose gel paste color to the first bowl. Stir to combine. Add 2 - 3 drops of rose gel paste color to the second bowl. Stir to combine. Add 4 - 6 drops of rose gel paste color to the third bowl. Stir to combine. 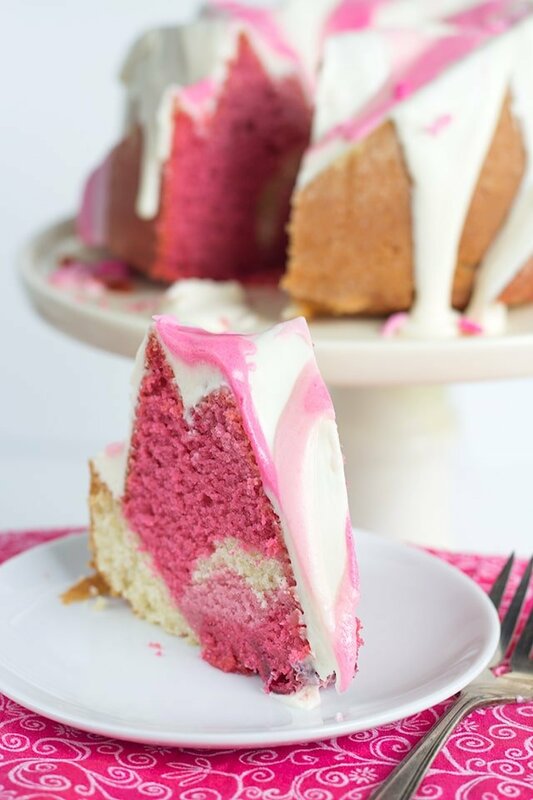 I placed each batter into a sandwich bag and piped them into the swirls of the bundt pan started with white and ending with the darkest pink. I tapped the pan on the counter to get rid of any air pockets. I then layered the cake batter colors in the center of the cake pan. Drizzle the remaining raspberry paste in the center of the cake batter. Place in the oven and bake for 1 hour or until done. Place a skewer into the center of the pan, if it comes out clean or with moist crumbs it's done. If it still has batter, let it bake a while longer and test again. Let it cool for 25 - 30 minutes and turn out onto a cake stand. Place the first jar of store-bought frosting into the microwave and microwave for 30 seconds. Stir. Pour the runny frosting over the bundt cake. I placed the second jar of frosting into the microwave and microwaved it for 30 seconds. Stir. 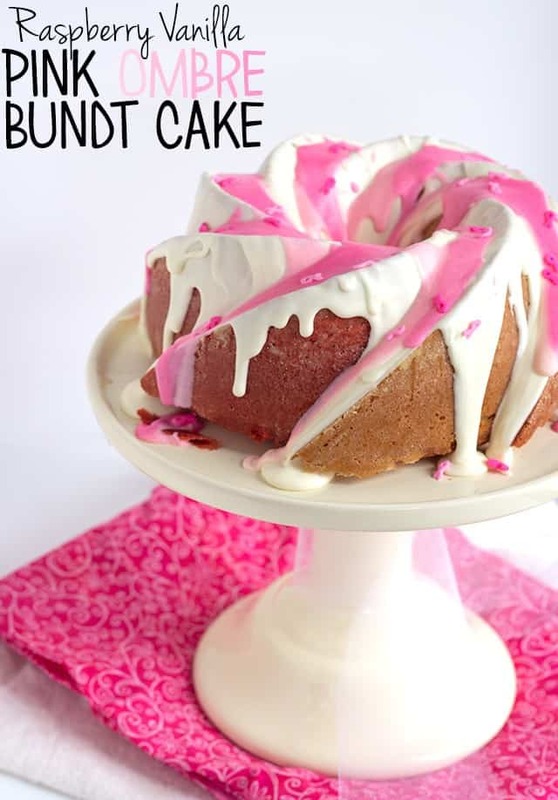 Place a drop of electric pink gel paste color into the frosting and stir. Make sure it's a very light pink color. 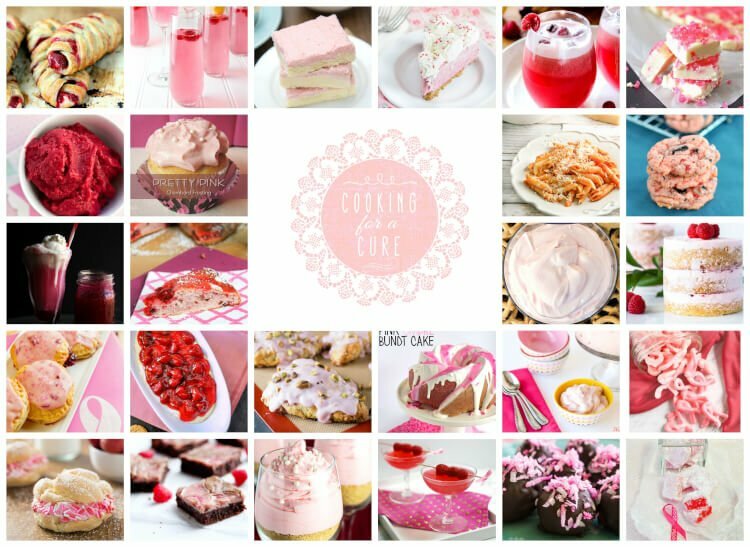 Drizzle the light pink down each crevice of the cake. 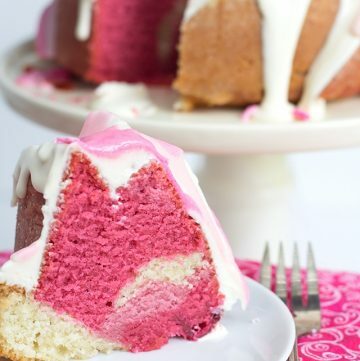 Add another drop or two of pink color to the frosting. Drizzle the darker pink on top of the light pink. Repeat adding 1 - 2 drops of pink color to the frosting and adding it on top of the other two pink colors. Immediately after adding the last pink drizzle, sprinkle with the pink ribbon sprinkles. Cut and serve. The inside is so pretty! Oh hey! There were a few others that wanted to bring awareness to breast cancer as well. Take a peek at all these goodies! What a beautiful cake, inside and out! I can’t wait to try it! This cake is so gorgeous! Everytime I see it around the web I get just a little bit hungrier. 🙂 My girls would love everything about it. Pinned!